I received this cowl from a mini run. I did not make the cowl. What I show here is what I did to finish the look and make it more wearable. The cowl fit over my head, but it was a bit tight getting it on and off. Without hair it might be a lot easier. 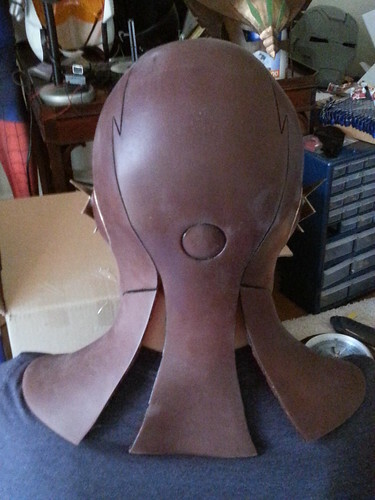 What I did was cut the cowl on both parts of the back. I thought about just doing one, but my OCD took hold and I had to do it even. If you have the same cowl, or a similar, you may be just fine with a single cut. I cut straight up the lines on the back of the cowl. Don’t cut too far, or you will have to do a long zipper, and don’t cut too short or you will still have problems getting your head in. I then got two invisible zippers from my Spider-Man stash, I cut the zippers to the right length (just past the length of the cuts on the cowl. I melted the zipper end where I cut because I used a really long zipper). I unzipped the zipper and glued half of it using Gorilla Super Glue Gel. (I tried contact cement, e6000, and a few others without avail). The gel works. Here is an image of the inside of the cowl. 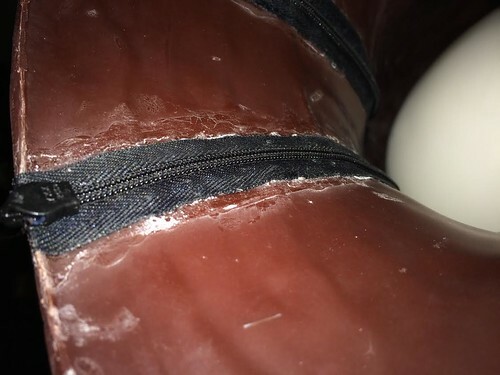 I added a little gel to the outside of the zipper as well to make sure it wouldn’t just pop off. 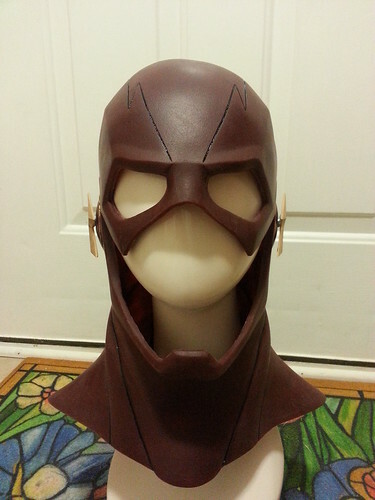 The zipper glued all around should stop the cowl from trying to rip straight up continually. Make sure that you have room to zip up and down. (I messed one zipper up, so you may want to get 3+ depending on how comfortable you are with gluing to the inside of the cowl). 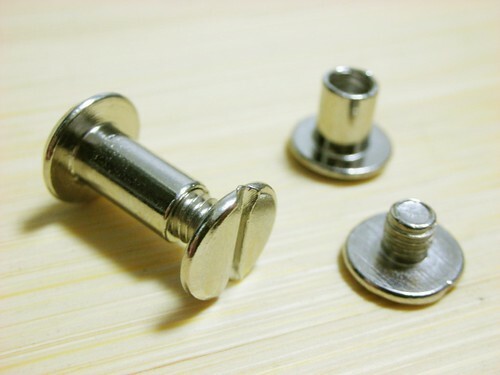 For the ear bolts, you can do this how you want, but I used Chicago screws. 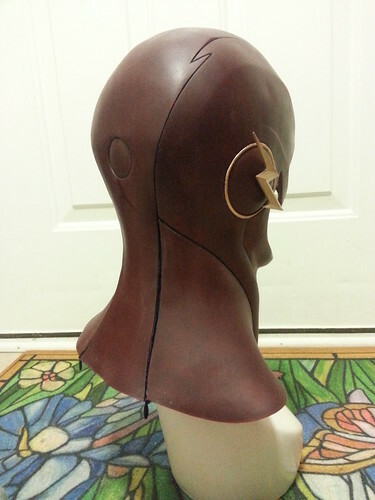 I cut the center part down to where it measured about the same as the thickness of the cowl ear part. I then glued half of it to the ear bolt. I punched a hole through the cowl using a leather hole puncher, because a paper hole punch would have been a little too thick. I then threaded the chicago screw on the bolt to the other one on the inside of the cowl. This keeps it tight and keeps it from popping off if you were to just glue the bolt right to the cowl. It does stick out just a tag unlike ones glued straight to the cowl. In the end, I painted using gold enamel paint. You can use whatever you like, but I got some nice gold from Michaels Craft Store in the hobby section (model paints). I painted the rings and the ear bolts. 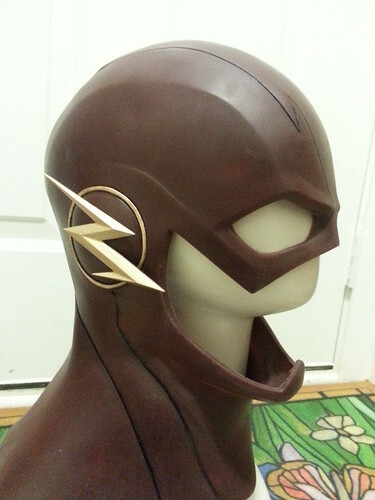 The ear bolts were painted prior to install on the cowl. 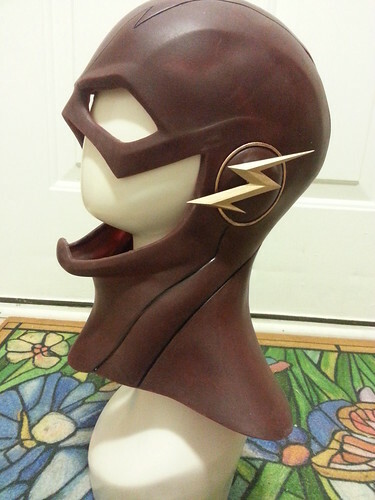 I also painted the line work black (enamel paint again) to give it a shadow on all of the lines (neck, head throat area, line leading back to zipper). I had the costume itself commissioned from Sean over at SMP Designs. For the build thread on Sean’s website click here. For the Build Thread on TheRPF click here.